Arsenal went top of the Premier League for the first time since February 2014 as headers from Olivier Giroud and Laurent Koscielny defeated Everton. After a cagey opening, the Gunners went ahead as Giroud met Mesut Ozil's floated cross with a deft touch. 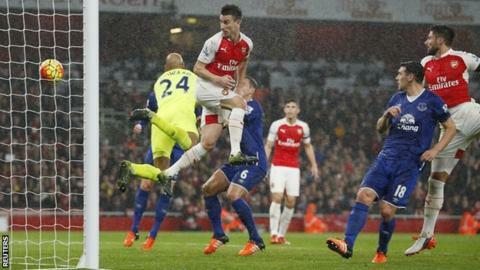 Koscielny doubled the lead two minutes later from Santi Cazorla's ball in. Ross Barkley's deflected shot brought Everton back into it, but Romelu Lukaku wasted an excellent, if rare, chance to level as he headed against the bar. Arsenal goalkeeper Petr Cech denied Gerard Deulofeu late on, but the hosts also had their chances to make the scoreline more comfortable. Everton's miserable evening was compounded by Gareth Barry's injury-time dismissal as he picked up a second yellow card for a foul on Kieran Gibbs. Ozil and Giroud were the scorers in Arsenal's Champions League win over Bayern Munich on Tuesday and the two combined brilliantly to break the deadlock after an even opening half hour. But Arsenal's fourth successive win was secured in more conventional fashion than their third. While the Gunners were penned back and starved of the ball against the Bavarians in midweek, they enjoyed 57% possession and regularly carved through Everton in an ultimately fruitless search for a third. Giroud and Ozil both hit the woodwork in the second half, with the latter sparkling with invention in a floating role behind the main striker. Ozil was ably abetted by Santi Cazorla who roamed upfield from his deep-lying position to prompt and probe as Francis Coquelin tidied behind him in midfield. It is now 22 meetings and more than 19 years since Everton won away at Arsenal. In more recent history, Roberto Martinez's side were fifth in the table after their win over West Brom at the end of September. They have picked up one point from three matches since to slide back to 10th. There are also problems for the future after captain Phil Jagielka limped off with an apparent knee injury after an innocuous challenge with Alex Oxlade-Chamberlain. The travelling Toffees fans faced a race across London on the final whistle after the last train back to Liverpool - the 21:30 from Euston - was cancelled. The home fans greeted news of the altered timetable with loud cheers. "Could have gone both ways"
Arsenal manager Arsene Wenger: "At 2-1 we became a bit edgy. We gave a lot on Tuesday night against Bayern Munich and I thought it showed in the last 20 minutes. "We couldn't score the third goal and Everton had chances - it could have gone both ways. "When you win such a big game like on Tuesday it shows a lot about the mentality of your team. "We have a lot of questions about our strikers but Theo Walcott is outstanding and Olivier Giroud is outstanding at the moment." Everton manager Roberto Martinez: "I thought we shot ourselves in the foot in giving away such an easy two-goal lead. "But I very much enjoyed the reaction - the personality and desire of wanting to get back. "We're very concerned about Phil Jagielka. It's a knee injury - we don't the extent of it, but that's the biggest negative today." Former Everton winger Ronnie Goodlass on BBC Radio Merseyside: "It's important for Everton to get a win soon. "They produced a good reaction to going behind, but you have do it for 90 minutes. It is the old what-might-have-been. Everton keep giving teams a one-goal start and then they are chasing the game." Olivier Giroud has now scored in four of his last five appearances for Arsenal in all competitions. Arsenal have lost just one of their last 17 Premier League meetings with Everton, winning 10 and drawing six. Mesut Ozil picked up his seventh Premier League assist of the 2015-16 campaign - more than any other player. Both sides are in League Cup action in midweek with Arsenal travelling to Sheffield Wednesday on Tuesday and Everton hosting Premier League Norwich on the same evening. Match ends, Arsenal 2, Everton 1. Second Half ends, Arsenal 2, Everton 1. Second yellow card to Gareth Barry (Everton) for a bad foul. Kieran Gibbs (Arsenal) wins a free kick on the left wing. Attempt blocked. Olivier Giroud (Arsenal) left footed shot from the centre of the box is blocked. Assisted by Mesut Özil. Mesut Özil (Arsenal) hits the right post with a left footed shot from outside the box. Assisted by Olivier Giroud. Substitution, Everton. Arouna Koné replaces Seamus Coleman. Attempt saved. Kevin Mirallas (Everton) right footed shot from the right side of the box is saved in the bottom left corner. Assisted by Gerard Deulofeu. Attempt blocked. Alexis Sánchez (Arsenal) right footed shot from the centre of the box is blocked. Assisted by Santiago Cazorla. Hand ball by Gareth Barry (Everton). Attempt saved. Gerard Deulofeu (Everton) right footed shot from the centre of the box is saved in the centre of the goal. Attempt saved. Mathieu Flamini (Arsenal) header from the centre of the box is saved in the centre of the goal. Assisted by Alexis Sánchez with a cross. Attempt missed. Mathieu Flamini (Arsenal) right footed shot from the centre of the box is close, but misses to the right. Assisted by Mesut Özil. Attempt missed. Olivier Giroud (Arsenal) header from the centre of the box misses to the left. Substitution, Arsenal. Mathieu Flamini replaces Alex Oxlade-Chamberlain. Romelu Lukaku (Everton) hits the bar with a header from the centre of the box. Assisted by Gareth Barry with a cross following a corner. Corner, Everton. Conceded by Alex Oxlade-Chamberlain. Attempt blocked. Kevin Mirallas (Everton) right footed shot from outside the box is blocked. Offside, Everton. Gareth Barry tries a through ball, but Kevin Mirallas is caught offside. Attempt missed. Brendan Galloway (Everton) header from the left side of the six yard box is close, but misses to the left. Assisted by James McCarthy with a cross. Offside, Everton. James McCarthy tries a through ball, but Romelu Lukaku is caught offside.